I got some sightseeing in today. I met up with Felicia (@thegeekyblogger) for breakfast (I would not recommend their eggs and grits since they needed seasoning but the bacon was tasty) at Cafe Beignet before heading over to the Jackson Square area. 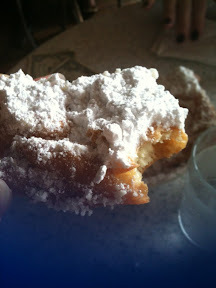 We stopped by Cafe du Monde and had some beignets. I now can say I prefer Cafe Beignet's beignets because they're fluffier; although the crispy Cafe du Monde ones were good too. 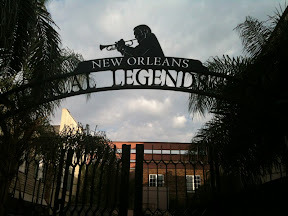 We walked around the area and did a little shopping until lunch when we stopped by Oceania for a po boy. So. Good. I was adventurous and went with the blackened alligator. I can't exactly describe what it tastes like (not exactly like chicken though), and the first bite had a gamy aftertaste. However, it was delicious! The spices, the coleslaw, and the crunchy French bread it was on melded together so well. I spent the rest of the afternoon in panels and various events. Awesome outfits at the Steampunk Tea. Then it was time for cocktail hour and dinner. Here are some photos with some of my Twitter friends. Then, being the old fuddy-duddy that I am, I went back to my hotel room and took a 2 hour nap (skipping the masquerade/dance after dinner) so I could go to the small burlesque midnight show at Irvin Mayfield's Jazz Playhouse -- burlesque dancers backed by a jazz band. I've got an early start tomorrow, so I better get to bed now.